Colony Wars and Cosmic Gambit: Buy Online Now! Due to delays from our printer, Colony Wars and Cosmic Gambits will not be generally available in stores until around February 2016. We still wanted to allow those who really want Colony Wars and Cosmic Gambits to get them this year, so we paid a premium shipping charge to airship a limited quantity of Colony Wars and Cosmic Gambits from China to our fulfillment center. Due to the cost of the air shipment, these will be more expensive than the suggested retail price. For those that pre-ordered via the Epic Card Game Kickstarter, yours will be shipped out over the next two weeks at no extra cost. You will receive a ship confirmation email from ShipNaked when your product has shipped. 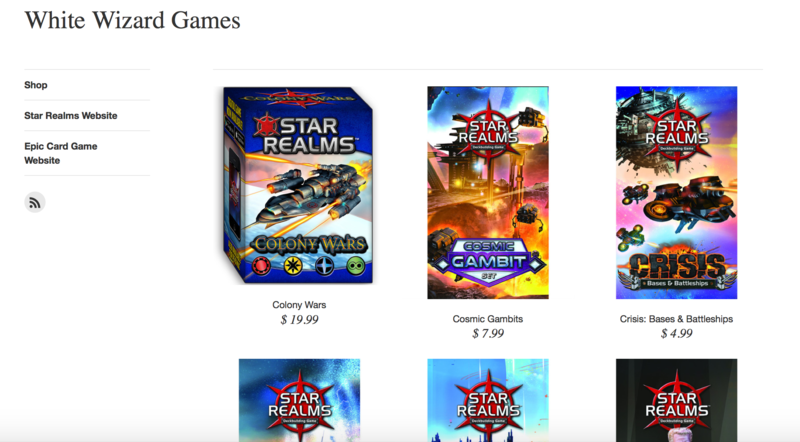 For anyone who has not pre-ordered Colony Wars or Cosmic Gambits as part of the Epic Card Game Kickstarter, you can now order Colony Wars and Cosmic Gambits along with other products on the new White Wizard Games e-commerce store. Now online! Buy Colony Wars and Cosmic Gambits at our Shopify Store! Colony Wars is a stand-alone expansion for the hit Star Realms deckbuilding game. The newly-discovered outer worlds, with their rich, untapped resources, are tempting targets for those seeking to expand their power. Now, the scramble for control of these unclaimed territories begins. Designed by Hall of Famers Rob Dougherty and Darwin Kastle, Colony Wars can be played as a stand-alone 2 player game or combined with the original Star Realms Deckbuilding Game to support an additional 1-2 players. This box contains a complete 2 player game with rules and 128 cards, including an all new 80 card track deck. Note: We paid a premium airshipping cost to offer Colony Wars in time for the holidays, and are selling it at a premium price of $19.99. This set will be widely available at your local game stores around February 2016, at a recommended selling price of $14.99. We will also do everything we can to get these games into retail distribution as quickly as possible, and encourage you to support your local game stores. Remember, these games will be available at normal retail pricing around February 2016.